Hi there! Lately I have been getting many requests to share more colored pencil techniques. Not only do I share tips for coloring on dark cardstock, but I also share how to make a gamsol pen! And to be honest, this video has helped me to fall back in love with my pencils. I hope it does the same for you. In my video I share tips for using the Polychromos Colored Pencils (SSS | AZ) and Caran D’Ache Luminance Pencils (SSS | AZ)… but I also show how to create your own “gamsol pen.” Gamsol is a product people use to blend colored pencils. You can put Gamsol into a Tim Holtz Alcohol Ink Fillable Pen for ease of use and I LOVE it! Be sure to watch the video to learn more about these cards, including lots of tips and techniques. My first card shows colored pencils on a dark cardstock. I used Caran D’Ache Luminance Pencils (SSS | AZ) along with Lawn Fawn Blue Jay Cardstock. The bird is from the Gina K Snow Birds Stamp Set (SSS | GK) and I stamped him with Gina K Jet Black Amalgam Ink (SSS | GK). I colored in the image heavily with pencils and then stamped the bird once again in the same spot with VersaFine Onyx Black Ink and clear heat embossed. Caran D’Ache Luminance Pencils (SSS | AZ) are incredible for coloring on dark cardstocks. The colors almost glow in real life! You can use other colored pencils, but the colors likely won’t be as vivid. 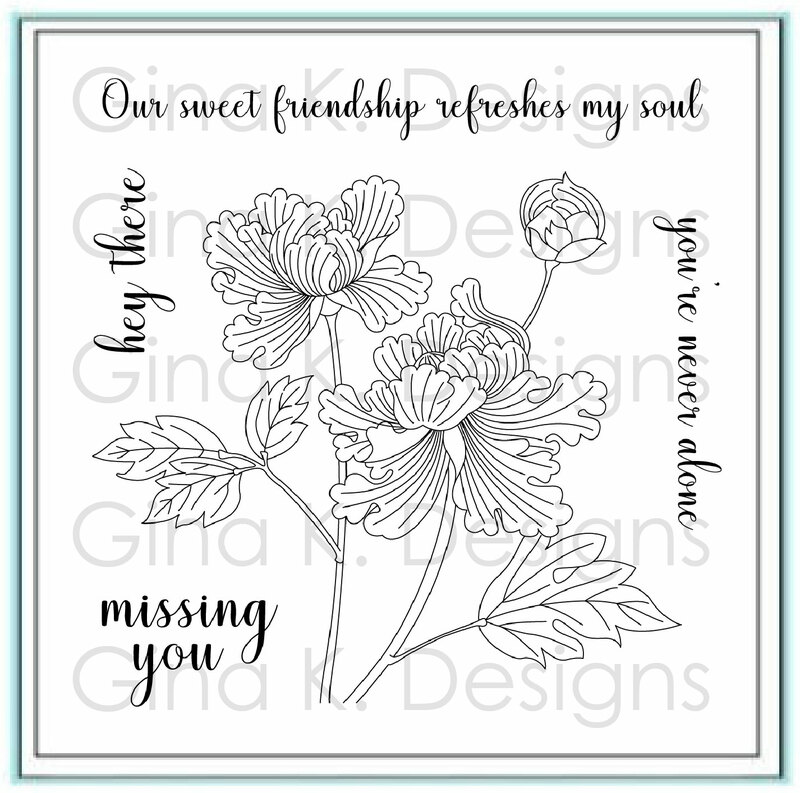 I added my bird into a Birch Press Dahlia Heart Layering die cut window and white heat embossed a sentiment from the Gina K Sweet Friendship Stamp Set. This next card also uses the Caran D’Ache Luminance Pencils (SSS | AZ) and Gina K Snow Birds Stamp Set (SSS | GK), but this time on white cardstock. I like to use the Koh-i-noor Bristol Cardstock for colored pencils… and love that it is bright white. I also created and used a “gamsol pen”… made with Gamsol and a Tim Holtz Alcohol Ink Fillable Pen. I used the Reverse Confetti Diagonal Stitches Die (SSS | RC) to create the faux stitched background and again added a sentiment from the Gina K Sweet Friendship Stamp Set. This card is another example of fast coloring with colored pencils. I used the Caran D’Ache Luminance Pencils (SSS | AZ) along with a lovely heart image from the Simon Says Stamp Love Always Stamp Set on Koh-i-noor Bristol Cardstock. I layered Birch Press Adora Layering Die cuts for a backdrop and added a Simon Says Stamp Tiny Words Stamp Set sentiment. My last example features the Reverse Confetti Big Bear Stamp Set (SSS | RC)… along with Polychromos Colored Pencils (SSS | AZ) with my “gamsol pen.” I also added a layered Birch Press Dahlia Heart Layered die cut piece behind him. That bear is the cutest! Want to find the products I used? I have listed them below. (Compensated affiliate links used at no cost to you. Thank you for your support! Affiliate and product disclosure can be found here. All products were personally purchased except the stamps and dies which were received from the company with no expectation. As always, this post was NOT paid for or sponsored.) Click on the icons below each product picture to go to a favorite store. I love using colored pencils. My favorites are Derwent Coloursoft, but I haven’t tried the 2 mentioned in this video. Oh my goodness! They both look great. Thanks for reminding me how wonderful colored pencils can be when coloring images! I love your cards and techniques. I have used colored pencils several years ago and now want to try them again. I love Prismacolors. I truly enjoy learning new tricks from you. I have dabbled in colored pencils and Gamsol, but that was as far as it had gone. This gives me inspiration to give it a go again! Beautiful cards! Thanks for the tips on how to use colored pencils. I never used them on my cards before, but I might have to give it a try, because it looks great! Such beautiful cards. You make it look easy 🙂 I have used colored pencils and Gamsol, but I’m not very successful. Partly I don’t like the stumps as they dull so quickly and are hard to sharpen. After reading on line, I just purchased an empty Copic marker and am going to fill it with Gamsol, much like your pen. I’m hoping to have better luck with that. Thanks for the opportunity to win. So glad to see a review on colored pencils because I’ve been wanting to purchase a premium set and seeing the differences between types and brands has been helpful. Also love the Lawn Fawn’s blue jay cardstock, such a pretty blue. Thank you for taking the time to put together this post and video. Have learned so much from your tutorials. User of colored pencils, but will be trying your pen! Love to color with colored pencils! I don’t do it as much on cards as I do for just coloring pages. I love colored pencils & use them often. They are easier for me than markers. I am excited to try the gamsol. Love your tutorials, always so helpful. Jennifer, I just LOVE your cards so much. I usually use colored pencils for coloring hair but now you have inspired me to keep doing more with the gamsol kit, which I never even knew existed! THANK YOU!!! I love your utube tutorials, I’ve learned so much from them. I especially loved the one about using your scraps, cutting them into strips and gluing them so that they make colorful backgrounds. I couldn’t figure out what to do with them. And the use of the t-ruler so that the words will be straight. So thank you for that. But all you tutorials are great! I do use color pencils not great ones but now I know which are good ones to invest in. And the use of Gamsol, in Tim’s H. blending pen is a great idea. So thank you. I’m so addicted to your blog. It is incredible! I’ve never used colored pencils for cards, nor have I used Gamsol. What a great addition! I would love to try it! Gorgeous coloring! Thanks for the video and all the information on different brands of pencils and the cool refillable alcohol ink pen for Gamsol. I have used colored pencils, but not very ofter, because they keep breaking. So excited to hear there ore break resistant choices! I love this technique. Thank you for sharing. I have been using colored pencils that we have lying around the house. I’m planning to buy a good set soon based on your recommendation.! Love your videos. This demo was incredible! I use the Polychromos color pencils right now, but am going to get the Luminance pencils, can’t wait! Also, the idea to use the Tim Holtz pen is great- I have an extra one I can fill up with Gamsol! Thank you for all these tips, and you do a marvelous job coloring, by the way! Jennifer, have you tried Zest-it® Pencil Blend yet? I love using my prismacolor pencils. I have a smaller set in my crop bag (I take to make and takes all the time) and a fuller set in my craftroom. I do need to improve my technique – but they are fun to use. I actually took a colored pencil class to learn techniques that I could use with my card making. I love the control and ease of using colored pencils and ability to blend colors. Of course, it takes some practice and your blog on colored pencils inspired me to use them even more! Interesting that some people get great results from coloured pencils. I do not, I started out with Derwent Artists Pencils but found they were too hard so after that huge outlay I bought some Prismacolour but don’t find them to be any better. Someone suggested Polychromos but I was told the Derwent Coloursoft were the best. When I went to buy the Coloursoft the fellow in the artists supplies said not to buy them and the Prismacolour were the way to go. I am very confused. I think I need to stick to watercolour. i haven’t tried regular colored pencils in years = but I often use my watercolor pencils. Not sure how different they are but I’d love to try! I loved seeing you use gamsol as watched Gina K use it , but found it a lot of work with the stumps so happy to see your use of the pen. You may have said, but where did you buy it from? Thank you so much. I adore using colored pencils to make my cards. I am intrigued at trying gamsol… I’ve used baby oil in the past for the same sort of a technique, but I hear the gamsol works lots better. I would sure love to try it with some new reverse confetti stamp sets! Thanks for another very helpful and inspiring post, Jennifer! I was really happy to see a review and video of gamsol! I have used it a few times on my own projects but your tutorial has really inspired me! Thank you so much! I also LOVE this dahlia die. So clever and beautiful. what I can create with what I already have and make my supplies stretch farther. I LOVE those birds! The coloring on the first bluebird is incredible. I don’t tend to use colored pencils, I’m much more likely to reach for my watercolor pencils. Because I don’t like the gamsol….but with the thought of putting them in the empty alcohol ink pen….hmmm….that might just be a game changer! But the one on the dark blue….amazing! I didn’t think there was a brand of colored pencils that could color over dark without multiple, multiple layers!!! Colored pencils are my primary media: so much more affordable than alcohol markers, longer lasting, and easier to use. Yes, I have actually gotten so that I prefer colored pencils to markers when making cards! Yes, I do use colored pencils. I have both Prismacolor and Polychromos and love both. I want to get better at Kathy Racoosin’s use of colored pencils in the nooks and crannies to make the card elements pop. Thanks. I especially loved your card with the bird. Yes, I have used colored pencils. Many times. I really enjoy using coloring pencils with gamsol. It makes it so easy to blend colors and add detail to a coloring project. What are your thoughts on watercolor pencils? Have you had much success in using them, or have you not attempted them before? Thanks for the great ideas and the use of a refillable pen! I only use color pencils. Crayolas are the best. Love your tutorials….have learned many things from you. Yes I do use colored pencils on most of my cards. Sometimes I like my results and unfortunately other times not so much. It appears my problem is the pencils I have used – so new pencils are on my wish list. I have been wanting polychromos for a while now. After your tutorial I am thinking Caran pencils may be a better choice. Will put them on my Christmas list and see how lucky I get (hopefully will get at least one of the sets). Thank you for your tips for so many different tools,, stamps, dies, storage….etc. I have made many purchases because of you! I have used colored pencils in the past and never liked my blending, thanks for the tips and I appreciate you showing more than one pencil brand! Colored pencils used to be My choice for coloring until the Prismacolor breakage got to be too much. I recently purchased the Polychromos and I’m going to purchase the Luminescence. Your suggestion to fill the Alcohol Blending Pen with Gamsol is wonderful! I like to color but find it hard on my hands. I think that the way you showed it in the video would really work well for me. The marker is so big. It makes me happy to think that I could enjoy coloring again. I like to color but find it hard on my hands. I think that the way you showed it in the video would really work well for me. The marker is so big. It makes me happy to think that I could enjoy coloring again. Thank you for the videos you do! Hope you are feeling better. Thank you so much for the video on making a gamsol pen using the empty alcohol pen. I happened to have one on hand that I not used for anything , so tried it. Oh my goodness– it works so nicely with colored pencils. I have the blending stumps and would try them every so often ,but it just seemed so tedious to use them. After trying your pen, I have colored more with my colored pencils than I have in a long time. The gamsol pen is portable, not messy, and can be used. anywhere. I have a very large Prismacolor set so will stay with it, but enjoyed your review of the other sets. I really enjoy your videos and your kindness work you do for your community. In the past 6 months I have been making cards for a residential rehab center close to my home. My sister-in-law and I have been making birthday cards, and then we started making holiday cards for the 60 residents. Sure gives me a good feeling that we may be brightening their day.